This hike takes the record as the most brutal hike in regards to the weather. This was the coldest day of the season with the combined windchills. The weather was in the teens, and the wind was continuously gusting to over 45 MPH, giving windchill values below 0. There was a Wind Advisory posted by the National Weather Service due to the punishing winds. In addition to the cold and wind, the snow was falling. It kept snowing throughout the hike and the wind picking up and blowing the snow was incredible. We had dressed extremely well for this hike, not letting any of body be exposed. I was even wearing a ski mask and ski goggles to keep everything warm and cozy. In fact, we hardly felt the brutality of the weather considering how we were dressed. I had initially wanted to go hiking across a like, but the park service rangers had not yet allowed walking on the frozen lake. 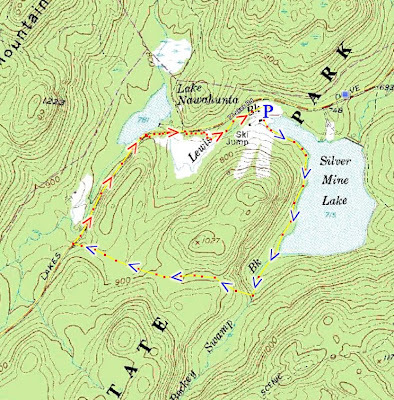 We started at the Silvermine Lake parking area, and hiked on the Menomine Trail along the side of the lake. Continued along till the intersection of the unmarked trail/Woods Road. Now we had intended to take the other unmarked trail sput to the top of the abandoned ski lift and hike down the ski lift trail, but due to the extremely poor visibility and snow covered ground we had entirely missed this trail and kept on going straight, until we hit the Appalachian Trail. Took the AT for just a short distance until we hit 7 Lakes Drive, and then went along 7 Lakes Drive northbound. The road was totally covered with snow and there were hardly any cars out, so this normally busy road felt more like a hiking trail then a road. Took the road until it intersected with the Menomine Trail, and then took the Menomine Trail east back towards the Silver Mine Lake Parking area and back to the car. Went home and had some HOT chicken soup. Me at the beginning of the hike. Abandoned ski lift in the background. Taking off my ski mask for the pose. Walking along 7 Lakes Dr.